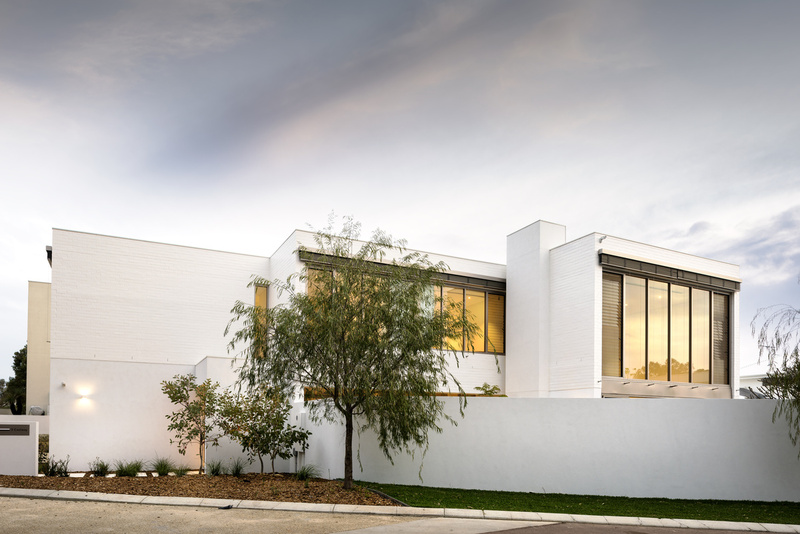 This spectacular home designed and built by award-winning custom home builder, Weststyle Design & Development, is the perfect setting for coastal living. 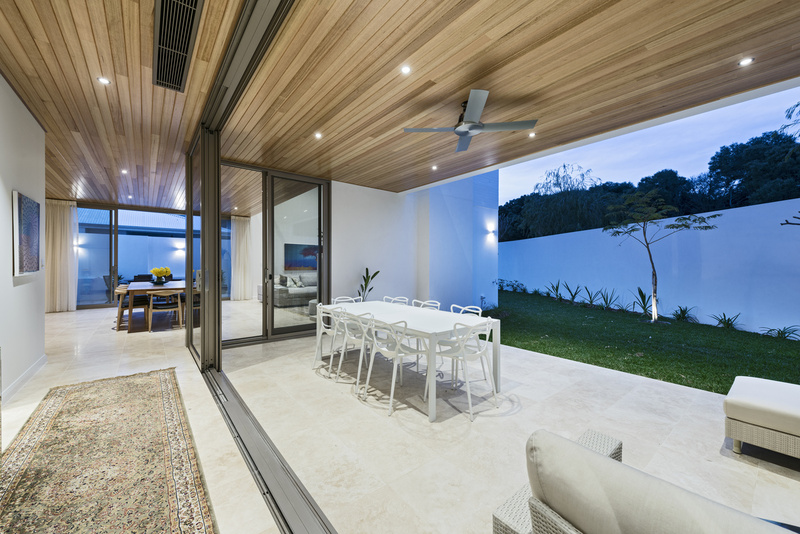 Timeless design elements and native-inspired landscaping provide a seamless blend of home and environment with a perfect amount of beach-side ambience. 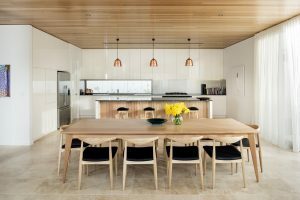 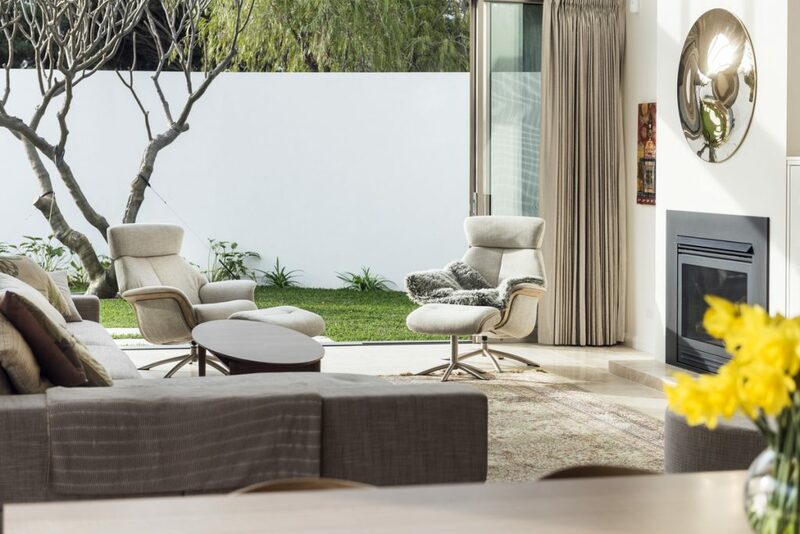 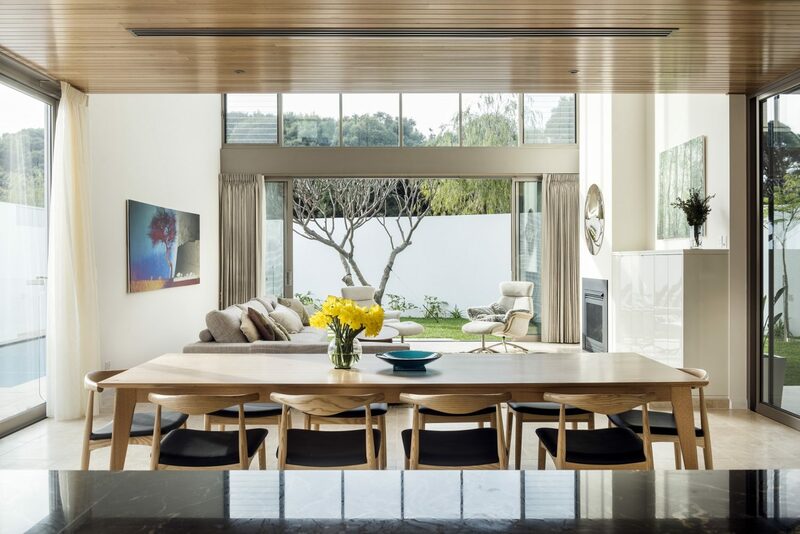 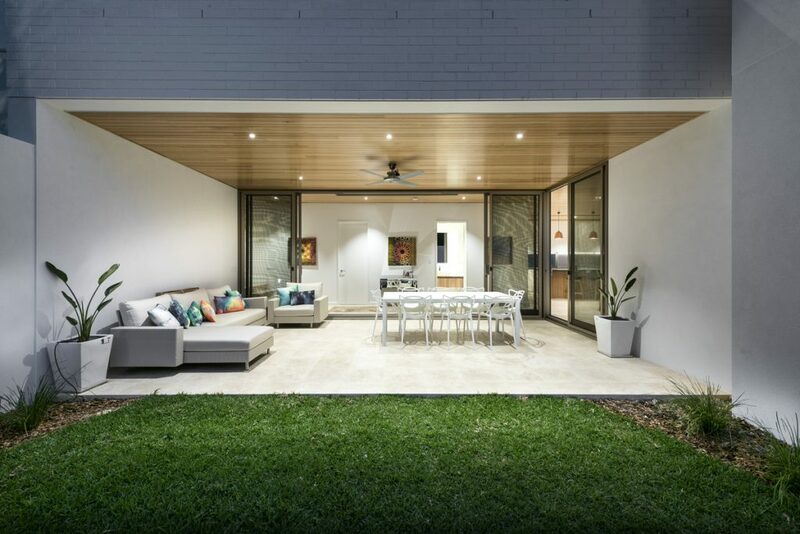 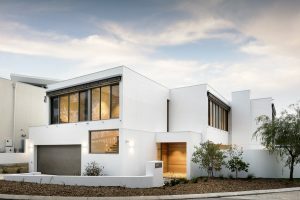 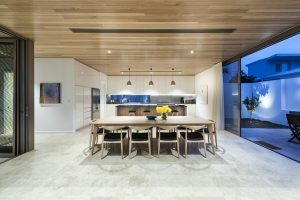 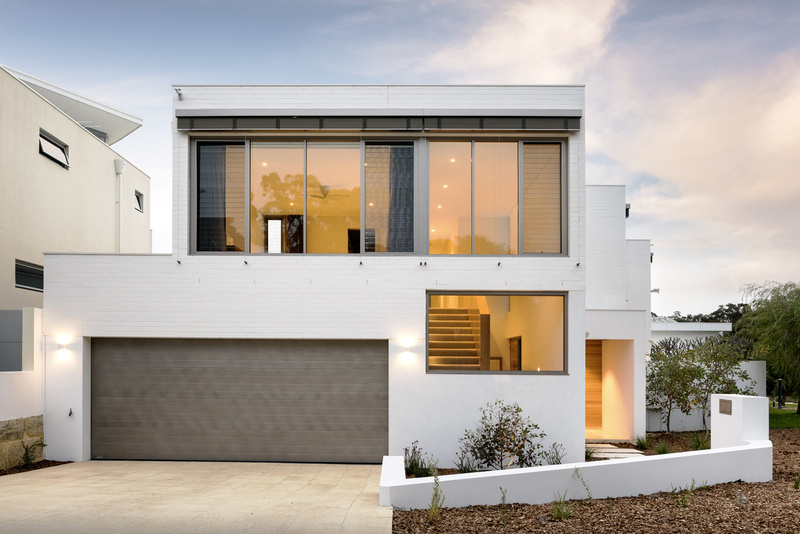 Despite an awkward shaped corner block, the home has an appealing façade from all angles and through clever design initiatives the home takes full advantage of the indoor/outdoor Perth lifestyle, incorporating large outdoor entertaining areas, whilst still maintaining privacy from the street and neighbouring homes. 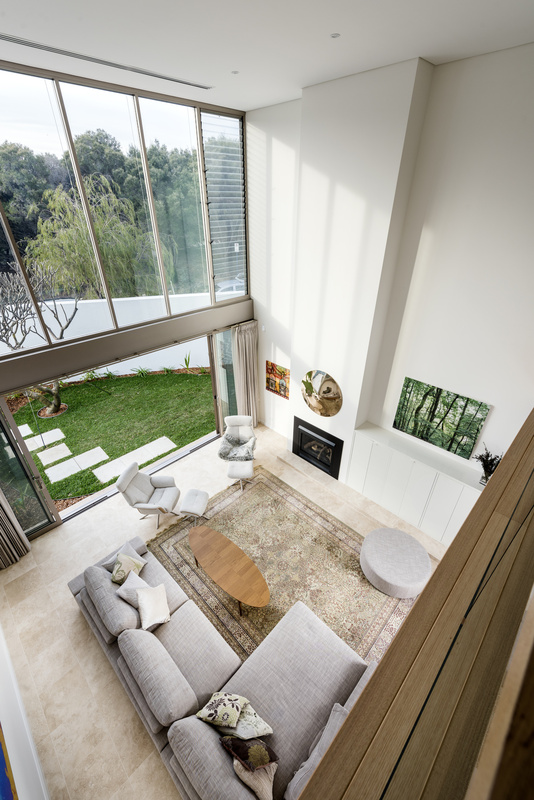 An expanse of ceiling height windows and a double storey void over the living area creates a dramatic feeling of space whilst flooding the home with an abundance of natural light. 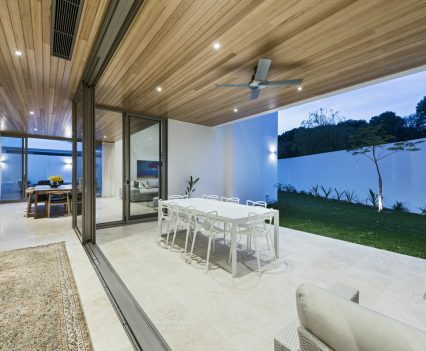 Louvres both internally and externally add to the ‘beach-side’ aesthetic whilst allowing natural ventilation into the home and enhancing privacy. 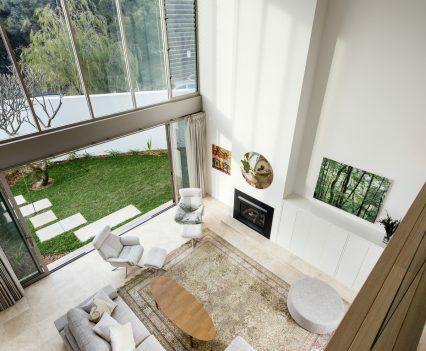 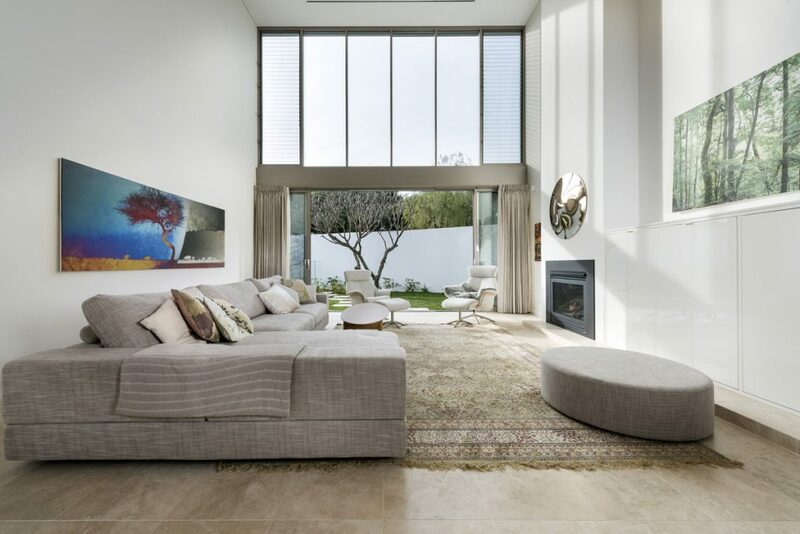 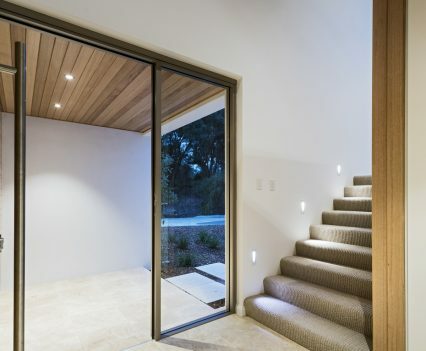 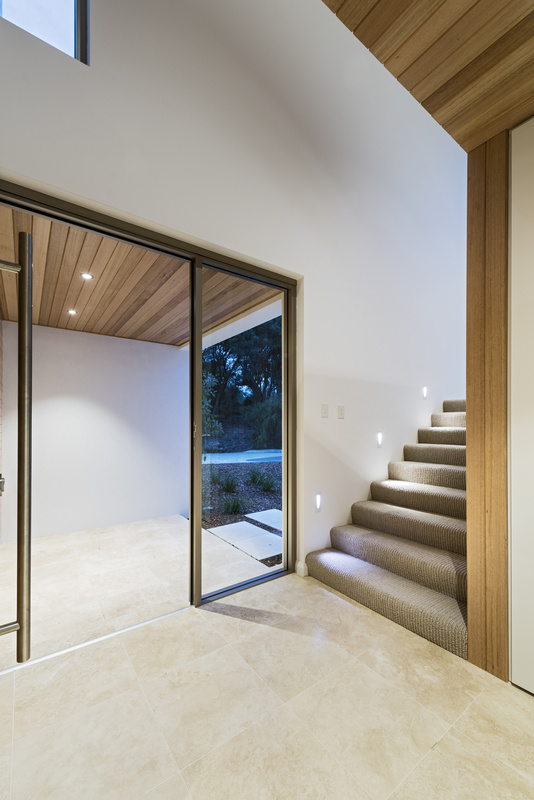 The neutral interior palette of the home combines a range of luxurious natural materials such as stunning travertine flooring which flows through to the alfresco areas and emphasize the seamlessness of interior and exterior living areas. 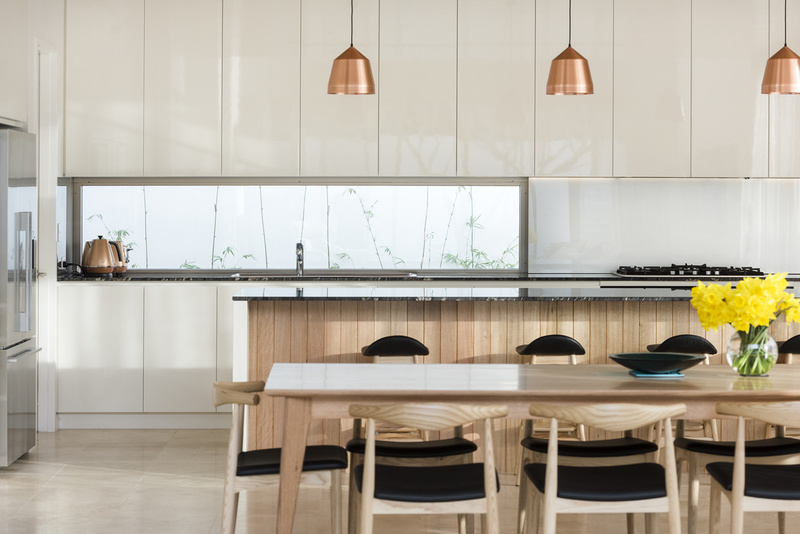 Copper pendant lighting and American White Oak timber panelling complements the casual elegance of the contemporary design whilst also adding warmth to the light and bright interior. 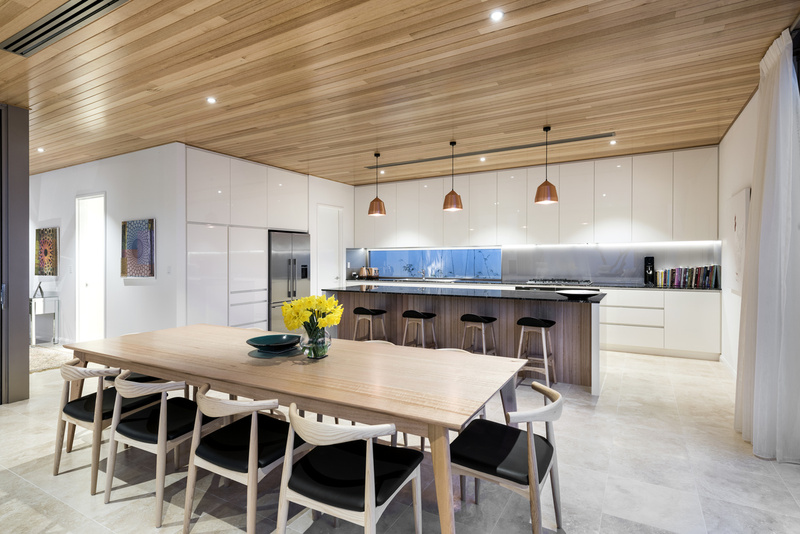 In the kitchen there is abundant storage behind sleek white lacquer cabinetry which extends to the shadow-line of the American White Oak ceiling for a clean, minimalist appearance. The island bench with titanium granite top provides an uninterrupted work space and breakfast bar. 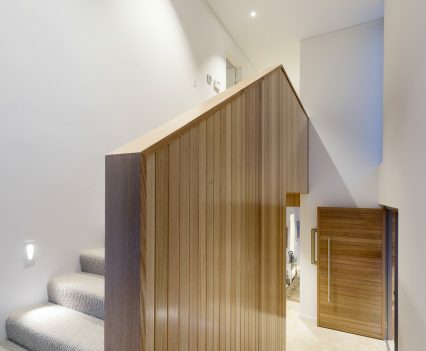 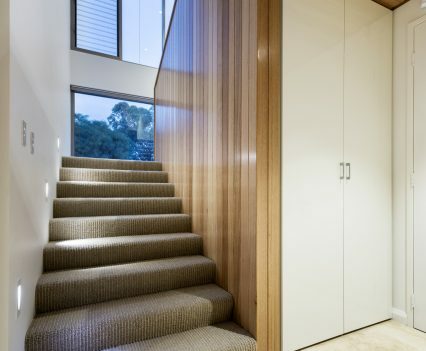 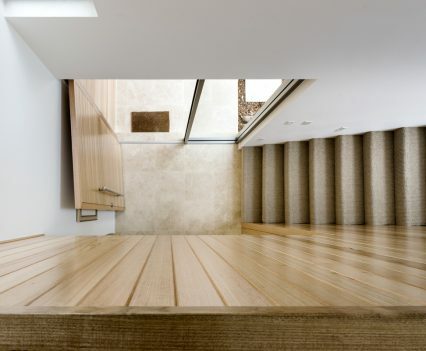 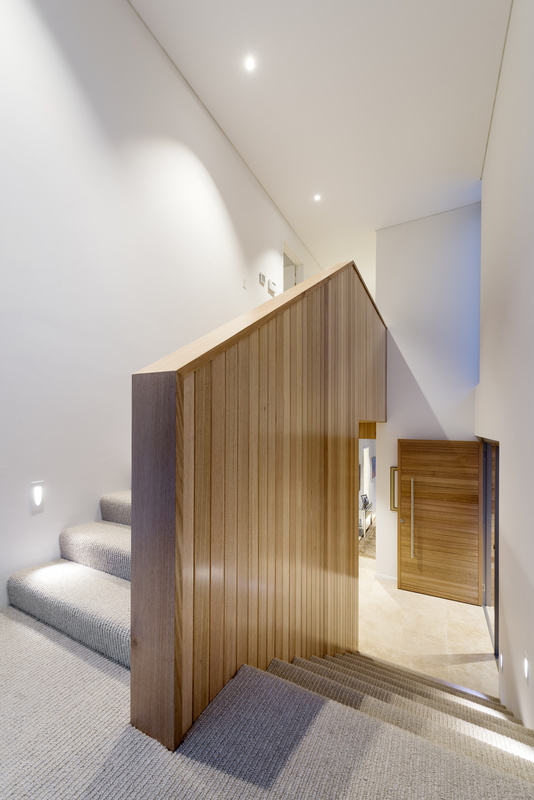 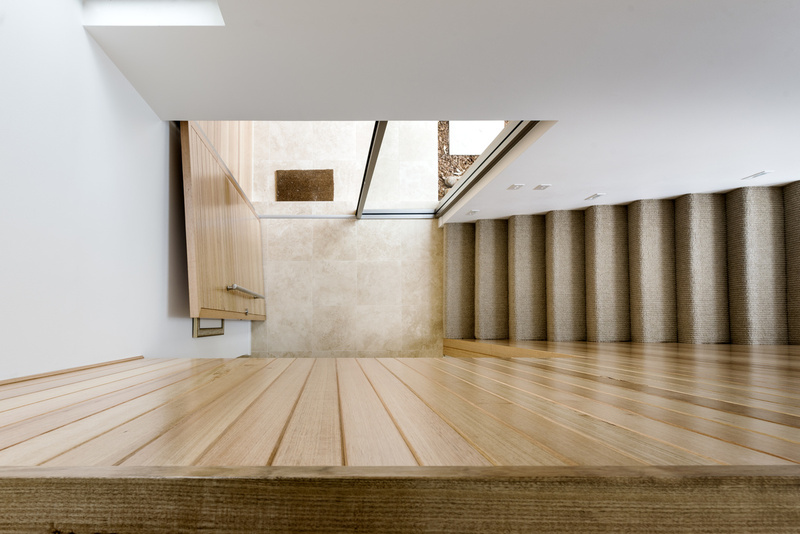 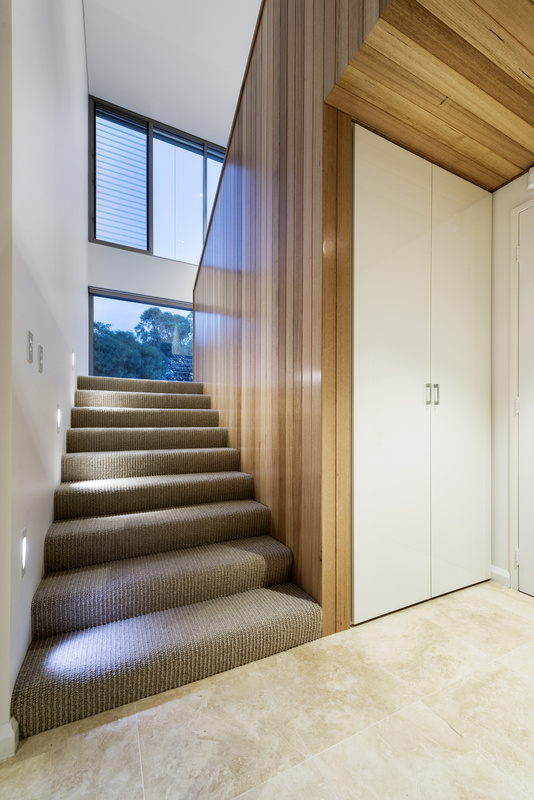 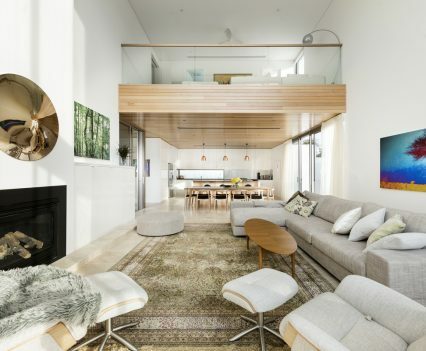 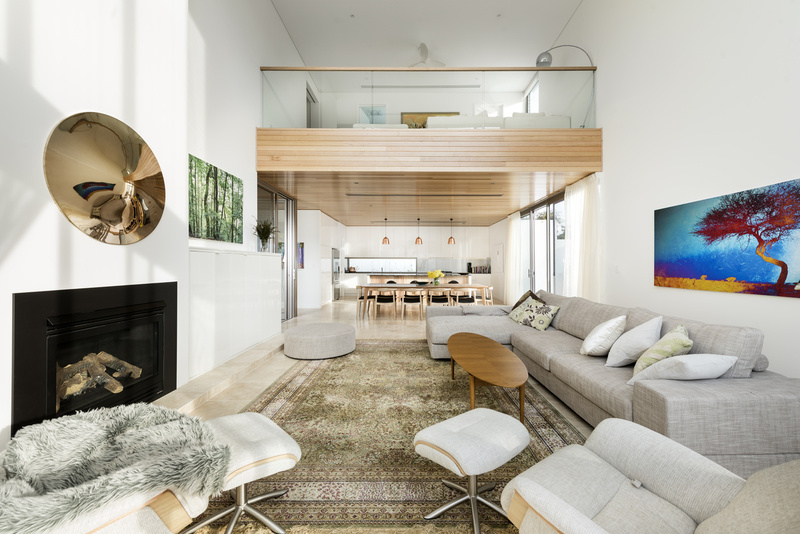 The timber accents continue throughout the home softening the clean contemporary lines of the open plan layout. 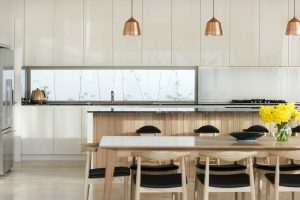 Throughout the home however the airy beachside feel continues and the impeccable attention to detail is evident with finishes such as light fittings and air-conditioning vents that have been powder-coated to match the copper metallic colour of the window frames. 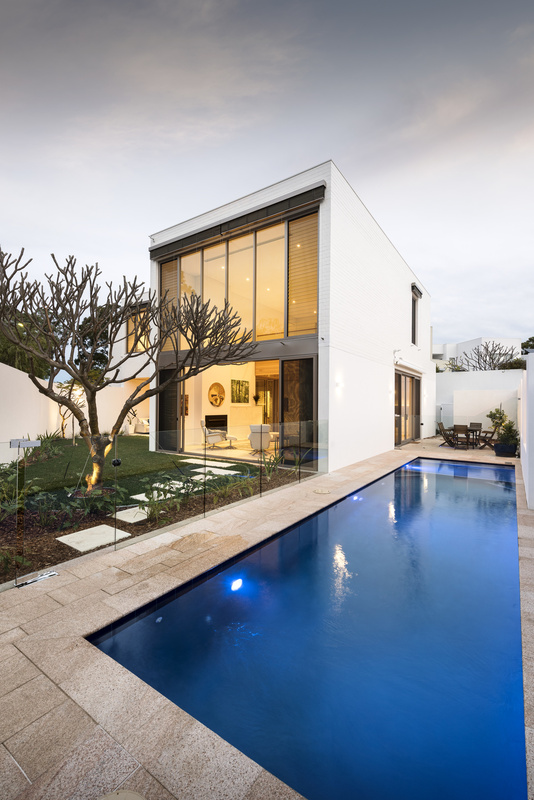 The luxurious finishes continue to the outdoor entertaining areas where a sparkling lap pool runs the length of the home and provides the ideal spot for a refreshing dip at the end of the day. 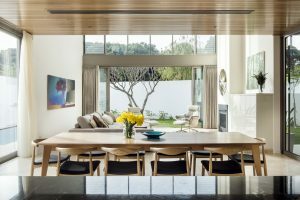 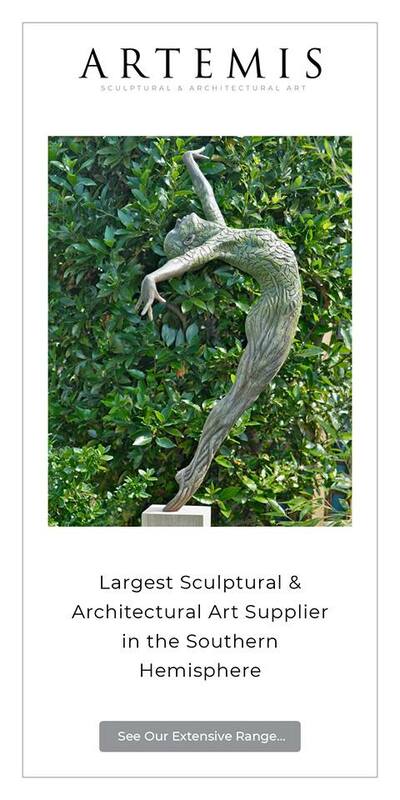 A highlight of the beautiful landscaped gardens is a sculptural frangipani tree that is perfectly framed by large glass doors and is visible from the kitchen area where your eye is drawn over the dining & living area to the lovely outdoor scene beyond. 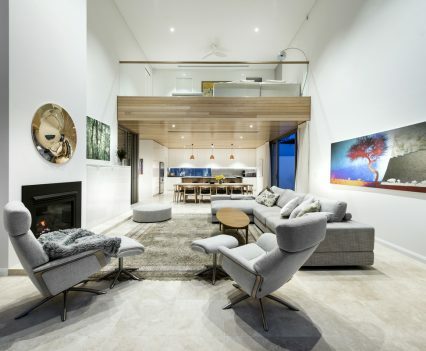 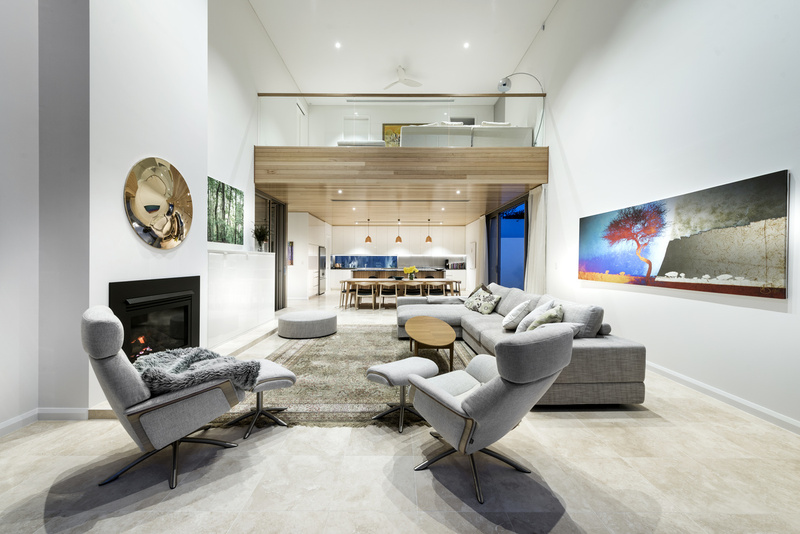 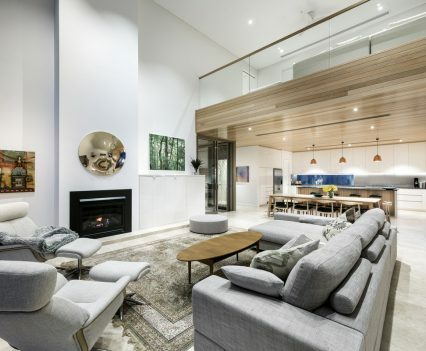 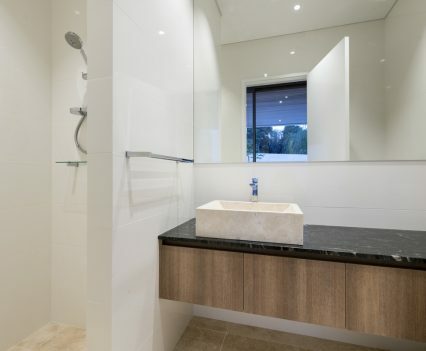 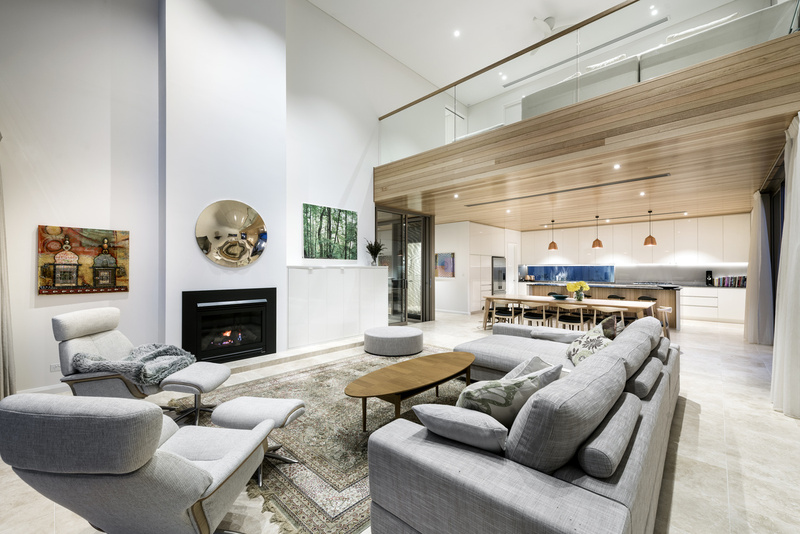 This contemporary home exemplifies Perth coastal living with a casual beach-side ambience combined with the quality and attention to detail that you’d expect of a Weststyle home. 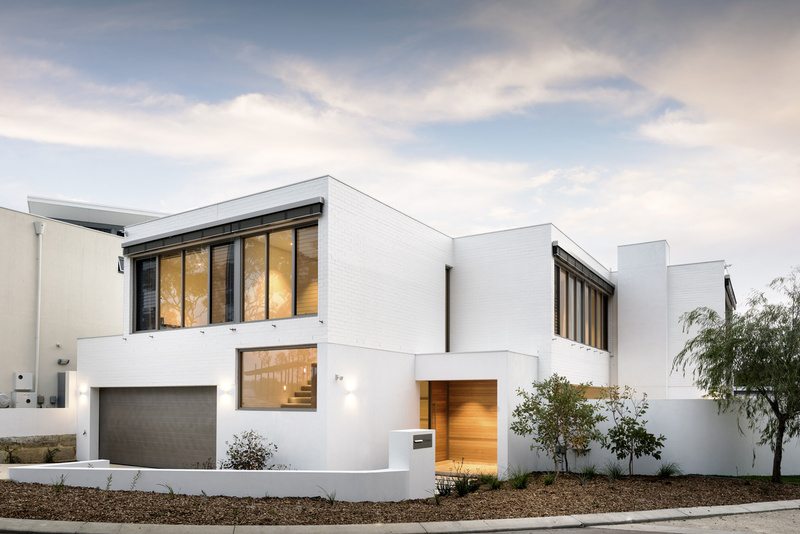 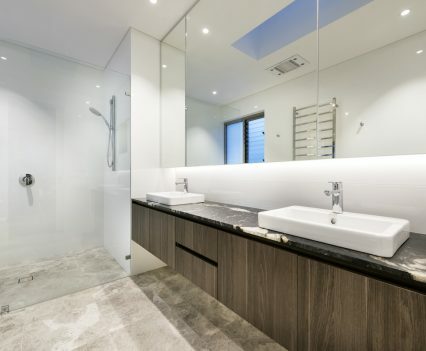 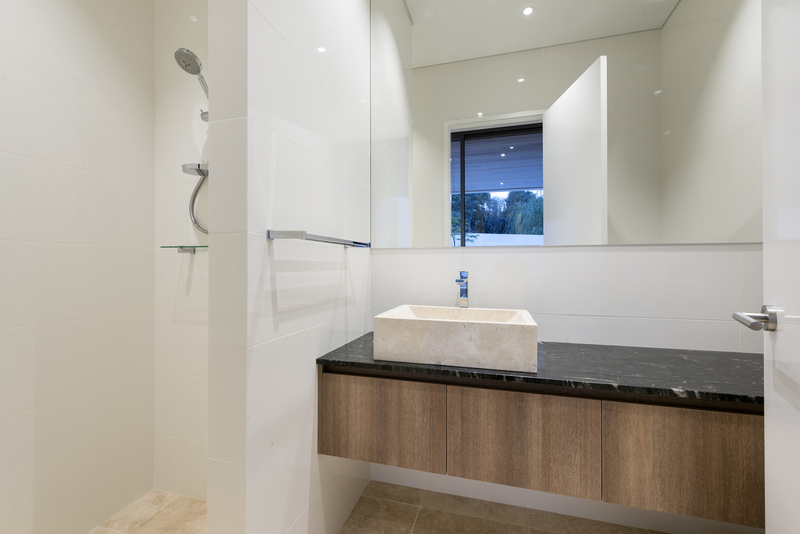 Weststyle Design & Development is a multi-award winning builder who specialises in luxury custom homes Perth, WA. 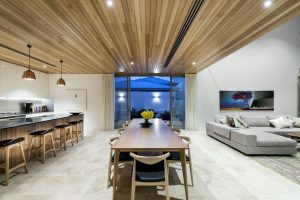 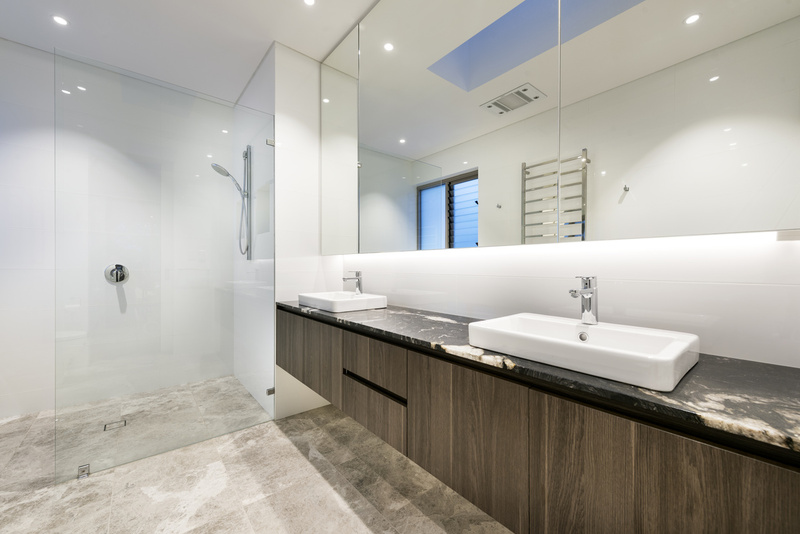 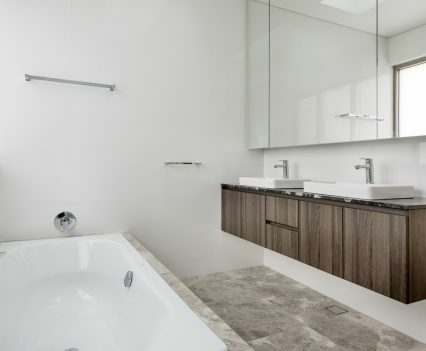 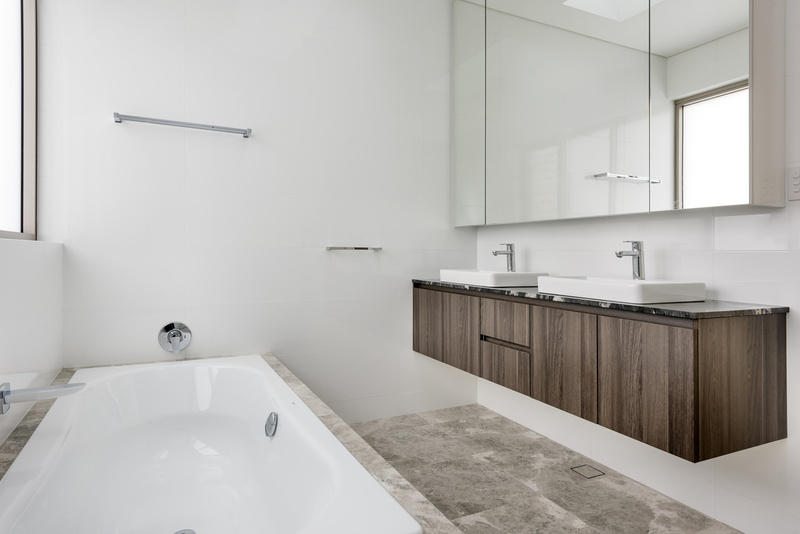 Weststyle’s in-house interior architects and designers incorporate innovative design features that meet both the lifestyle and the needs of the owner. 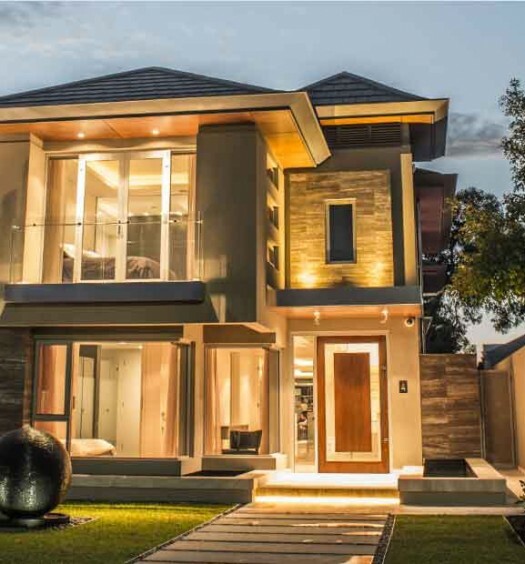 Weststyle provides clients with comprehensive design and building services, and their caring professional designers guide clients through the every step of the process, from concept to completion.